Being a mum is a privilege as well as it being hardwork which is why we can never get tired of celebrating mothers who take this role seriously. 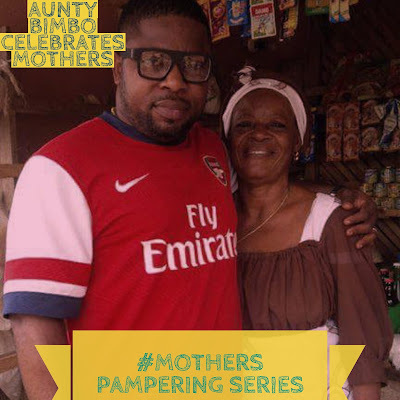 One of such mothers is Babatunde Arikawe's mother, Alhaja Arikawe makes our Mothers Pampering Series Hall of Fame. Below are his exact words in describing his mum and how selfless she has been. "Motherhood is tough, 24 hours job, no pay, no day off, sometimes it is unappreciated, yet resignation is impossible. I keep wondering how you find the energy to do all the things you did, to be a teacher, nurse and counselor to me, when I was a kid. How did you do it all, mom? a chauffeur, cook, yet find time to be a playmate? All that keeps coming out of my mouth is thank you Mom. I am dedicating this to all the mothers out there, you are all our heroes. May you live long enough to eat the fruit of your labor.. Eni eleni koni gbase yin se... Lojo inkan ayo yin, Olorun Oba koni fiyin pamo. Translation: Nobody else will reap the fruit of your labor and on the day of your rejoicing may you be alive to enjoy it!